Scout Trooper's are specially trained soldiers with lighter armor affiliated with the Galactic Empire and lead by Emperor Palpatine. They were trained to be easily adaptable and more independent when they were dropped in different environments. They appeared in the film Star Wars: Episode VI - Return Of The Jedi in 1983. They're well known for riding speeder bikes through the forests they patrolled during the battle of Endor. Their mission was to guard the shield generator from a rebel attack during the construction of the Death Star. 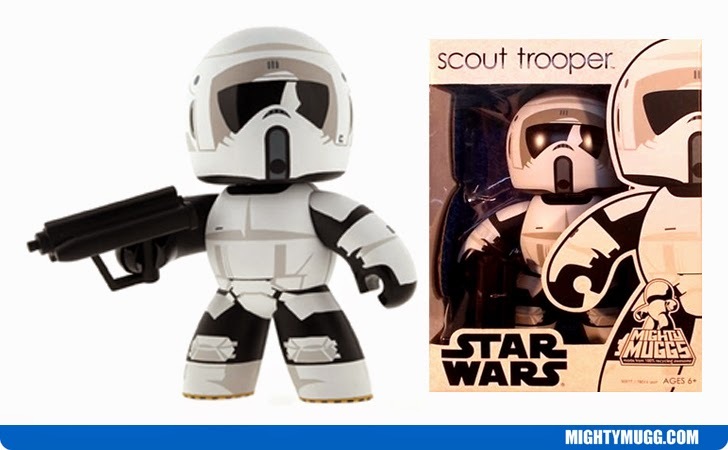 The Mighty Mugg above portrays a trooper in his black and white armor with a blaster.